Attractive 6-sided block holds all you need to clip, smooth, and buff nails! Each side of the block is either a coarse or smooth file, or a buffer. And never lose the clipper, because it fits right in the block! Packaged attractively in a clear bag with a coordinated card. Bible verse featured on clipper and block: Be still, and know that I am God. 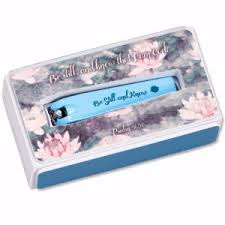 Psalm 46:10 An attractive gift for Christian women!